14-Apr-2004 -- Please note that this is a protected, permit only area, and the City of Walla Walla and the U.S. Forest Service patrol the watershed and it’s perimeter, and local and federal penalties include fines and/or prison. Human activity in the watershed is limited and controlled in order to protect the quality of the water, which is treated and served to the residents of our valley. I was asked to document the confluence as the City’s water quality specialist as a part of other duties while in the watershed. This trip involved over five miles of cross country hiking in very hilly, rocky terrain. We waded across several creeks, and climbed several hundred feet, only to encounter brush and forest canopy so thick at the confluence that we were unable to obtain a GPS reading until we backtracked down the hill about 150 feet. Larry, our watershed attendant (and by far the more athletic of the two of us) entertained me on the way with stories of his most recent bear and cougar encounters out here. He regularly encounters wildlife on his patrols, and has fond memories of being charged by bears and stalked by cougars. He told me that he felt safer having me accompany him, as he can run faster than me and predators usually single out the slowest prey. I was glad I could do that for him. Seriously though, this is very pristine country that has seen little human presence. The scenery was beautiful, and thought it was a challenging hike (for me), it was a very enjoyable experience. 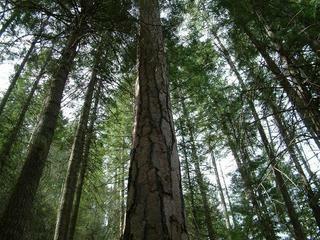 Down in the lower areas, there are numerous streams, but there is not a lot of underbrush. The hillsides however, alternate between rocky with sparse trees, to heavily forested with conifers and very dense underbrush. Coordinator's Note: The GPS coordinates show a position about 118 meters from the confluence. The visitors have confirmed that they were within 100 meters of the confluence to take the photos, so this visit is considered a success. 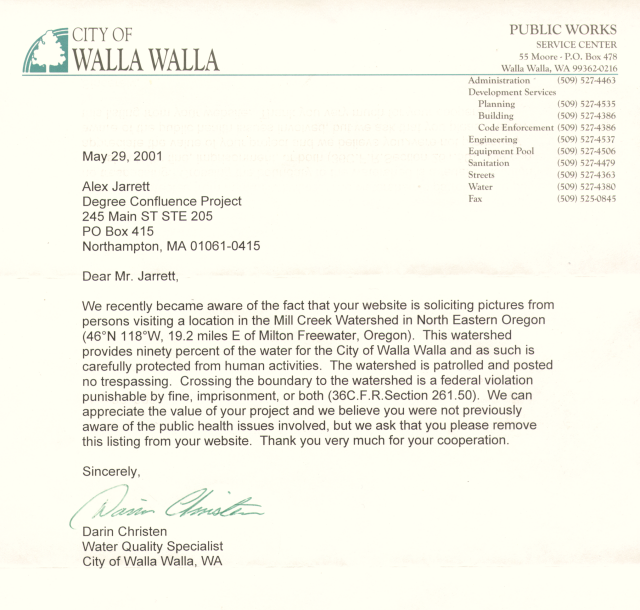 We have received a letter from the Walla Walla (Washington) Public Works department regarding this confluence. Because of this, we will not be accepting any visits to this confluence without proof of legal access, which could include written permission from Walla Walla Public Works. Remember, if a confluence is on posted land, obtain permission and don't trespass! NOTE: While the letter from the Walla Walla (Washington) Public Works department appears to be correct, it is not quite complete. It appears that there is another legal means of access. Apparently, a limited number of elk tags are issued to hunters each year specifically for hunting within this area. If you are issued such a tag, you can then apply for permission from the United States Forest Service, which then gives you an unassailable legal right to enter this area for the purpose of hunting elk. Note that the Oregon and Washington sides of this area are in different jurisdictions -- the confluence appears to be in the Oregon hunt area -- a Washington state tag might not allow you to get within 100 m (though it will be close if you cannot). Note that we reserve the right to ask for proof of legal access, such as a picture of your relevant hunting paperwork.